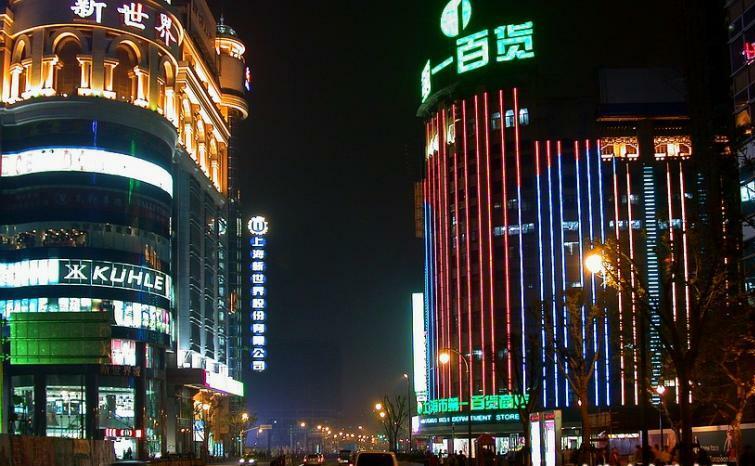 Length: 5.5km for an overall length; 1599m for Nanjing East Road, 1033m of which is the pedestrian street; and 2933m for Nanjing West Road. 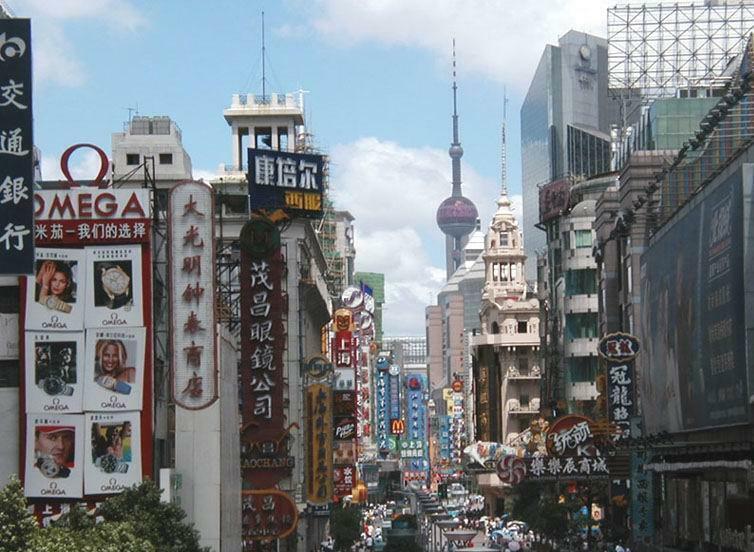 After the first Opium War (1840-1842), Shanghai became a treaty port. 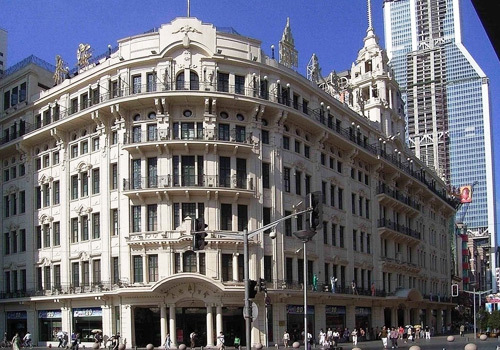 The present Nanjing Road was first the British Concession, and then an international settlement. Started from vendors, the road became the earliest shopping street in the city with imported large quantities of foreign goods. 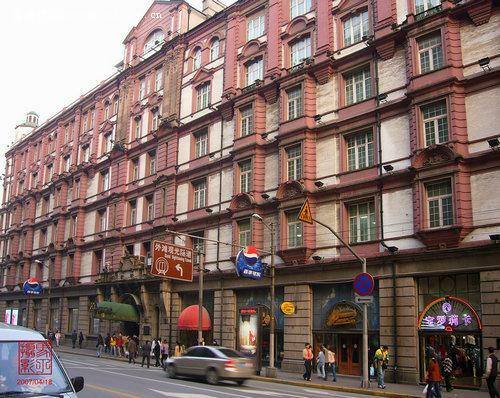 To cater for the increasing recreational requirements of foreigners, the street was constantly expanded with department stores, restaurants, shops, and hotels. 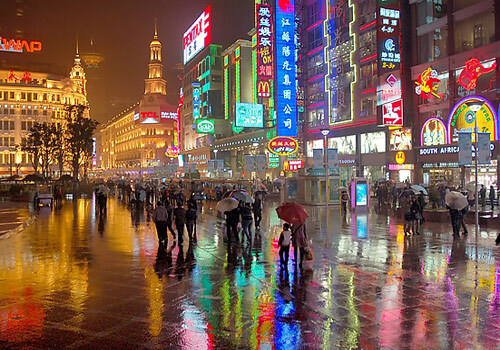 Over time, the road was restructured and underwent significant changes, and today, modern shopping malls, theatres, specialty stores, cafes and international hotels have flourished on the street. 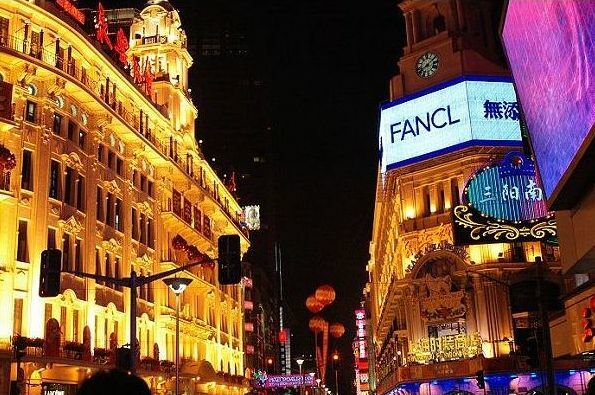 A generalized Nanjing Road possesses two of the top ten commercial centers of the city, the Nanjing East Road and Nanjing West Road; while the Nanjing Road in a narrow sense just refers to the Nanjing East Road, within the widely known Nanjing Pedestrian Street. 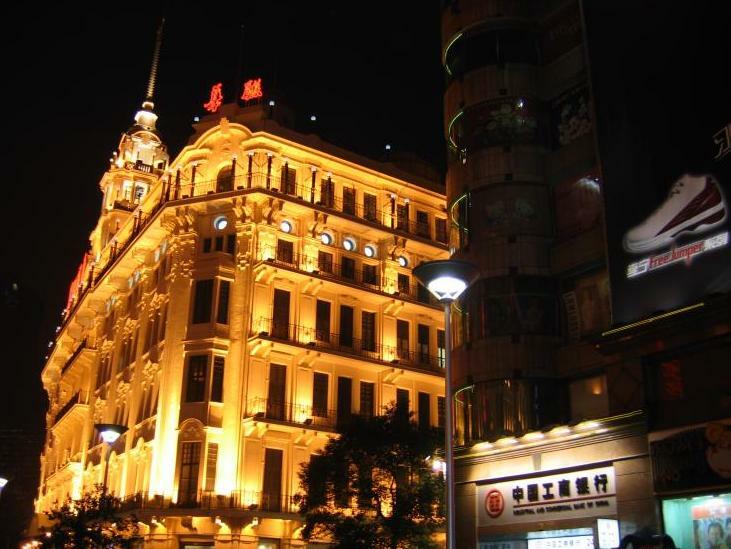 Starts from the Bund, ends in Xizang Central Road and crosses the Hennan Central Road, Nanjing East Road's fame relies on its stylish commercial buildings, advanced equipments, a superb collection of wares, superior management and pleasing shopping environment. As the No.1 business street in the country, it is a street pioneer that first introduced the escalators, hanging garden, kinds of amusement performances of kid shows and magic, cafés, top-level restaurants, tearooms, hotels, as well as uniforms for shop assistants. 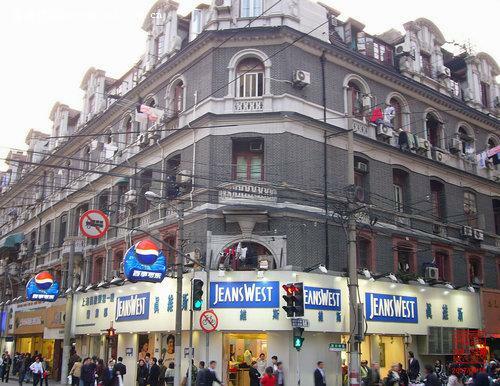 With a mass of century-old shops and famous modern brands on two sides, the street features mid-range business and enjoys the title as a Shopping Paradise. 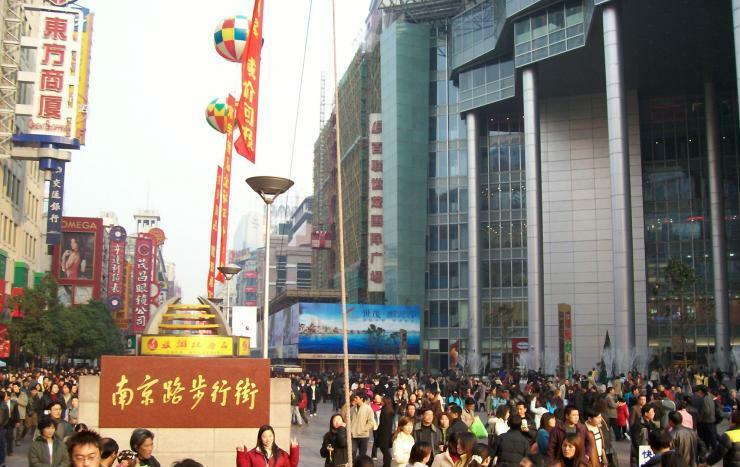 Belongs to Nanjing East Road, the pedestrian walkway occupies two-thirds of the road. It starts from the Hennan Central Road and the ground is paved with clean faintred stones. Beautiful parterres and green belts lie in the middle path of the road and besides each parterre, dark-red marble seats are set for respites. New fashions, trackless sightseeing trains, hustle and bustle of large crowds and abstract sculptures are all the words for the street. Falls into Jing'an District from Chengdu North Road to Yan'an West Road, this section is the top-level commercial street of the city that houses various slap-up shops and upscale famous brands as well as a number of traditional stores and specialty shops providing choice silk goods, jade, embroidery, wool and clocks. - By buses No.17, 18, 20, 21, 22, 23, 37, 55, 921, etc. 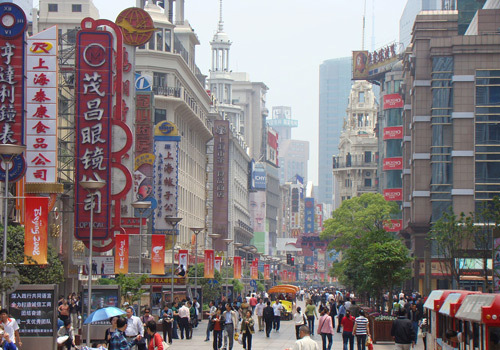 and get off at the station of Ren Min Guang Chang (人民广场, People's Square) or intersections of Nanjing Road. 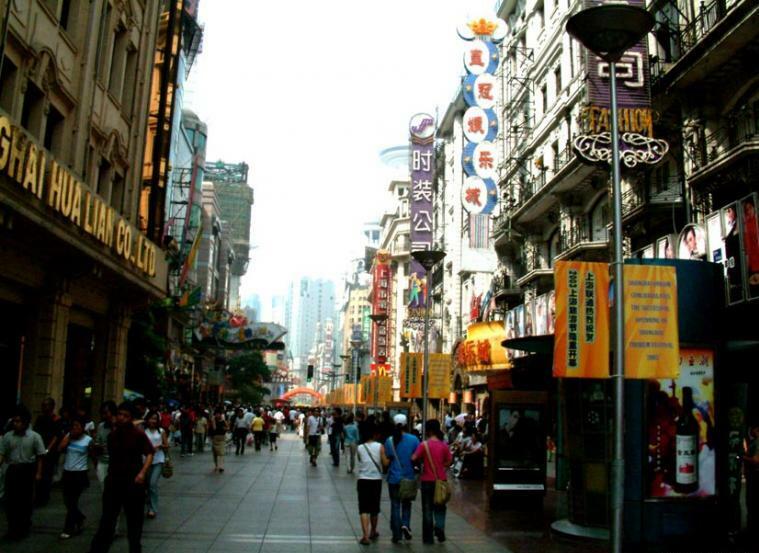 - By subway No.1, 2 or 8 and get off at the station of Ren Min Guang Chang or Nanjing Dong Lu (南京东路, Nanjing East Road).